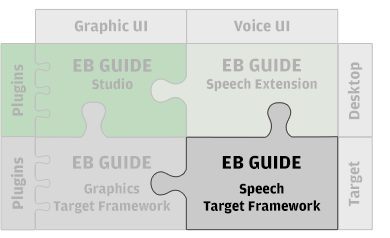 Use EB GUIDE Speech Target Framework to deploy the speech dialog model in the vehicle, once you’ve developed it with the integrated human machine interface (HMI) development tools EB GUIDE Studio and EB GUIDE Speech Extension. In EB GUIDE Studio you can use the EB GUIDE STF to simulate the speech dialog. That way, during development, you can interact with the speech system and experience it just as the customer will in the car. The framework uses state-of-the-art speech technology, allowing you to create familiar and comfortable interactions for drivers. EB GUIDE STF can be extended with additional speech dialog resources dedicated to automotive use cases like navigation, radio, and address book. This allows you to rapidly integrate speech-enabled applications like navigation, tuner, and organizer. Adapts to various operating systems and platforms like automotive and consumer electronic devices.